Jeryl Lynn Brown Anderson, Special Initiatives Coordinator Orange County Emergency Services has been a Telecommunicator for over thirty years. She is currently employed at Orange County Emergency Services, as the Special Initiatives Coordinator. Jeryl has been a certified instructor since the 1990’s and has vast experience in class room presentation to include, but not limited to, curriculum and testing development and on-line course development and implementation. Jeryl is proud to have been at the beginning of the Telecommunicator Certification Course for North Carolina Telecommunicators, during her time as a Criminal Justice Instructor Coordinator with the NC Justice Academy, where for eleven years, she taught, edited, and implemented the curriculum across the state of North Carolina. Jeryl is an experienced on line instructor, conference speaker and event coordinator. 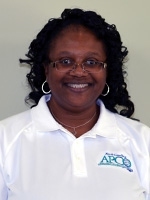 Jeryl is an RPL through National APCO and an ENP through National NENA.